Opposition Leader Juan Guaido took an oath swearing himself in as Venezuela's interim president on Wednesday, as hundreds of thousands marched to demand the end of socialist leader Nicolas Maduro's government. Within minutes, Global Affairs confirmed Canada will recognize Guaido in the role. 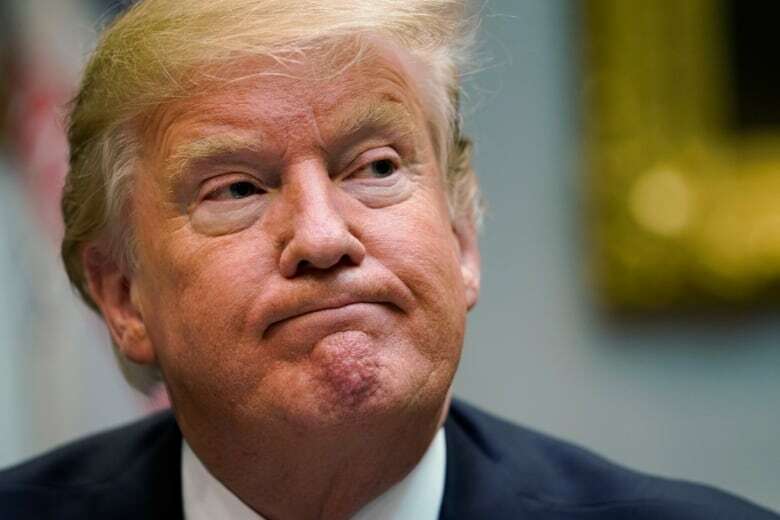 U.S. President Donald Trump issued a statement doing the same, and encouraging other Western governments to recognize Guaido as interim president. 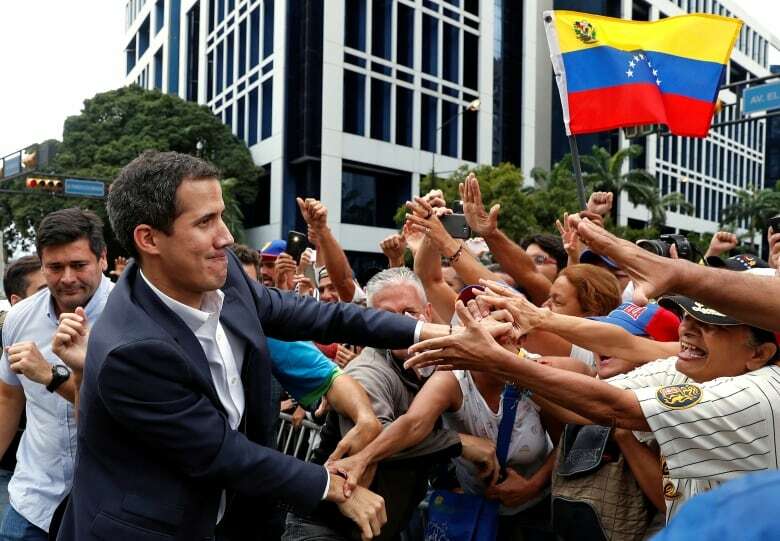 Argentina, Brazil, Chile, Colombia, Guatemala, Paraguay and Peru indicated they too will recognize Guaido. A spokesman for Mexico's foreign ministry said Mexico does not plan to change its policy on Venezuela "for the time being." Bolivia's president also affirmed his solidarity with Maduro in a tweet. Demonstrators clogged avenues in eastern Caracas, chanting "Get out, Maduro" and "Guaido, Presidente" while waving national flags. Police fired tear gas to disperse protesters in several areas. A rally the night before reportedly left four people dead, an echo of tumultuous riots two years ago. "I swear to assume all the powers of the presidency to secure an end of the usurpation," he said. In response, Maduro announced Venezuela is cutting ties with the United States. He has given U.S. diplomatic personnel 72 hours to leave the country. "Before the people and nations of the world, and as constitutional president … I've decided to break diplomatic and political relations with the imperialist U.S. government," Maduro told a crowd of red-shirted supporters gathered at the presidential palace. While both countries operate embassies in each other's capitals, neither has had an ambassador since 2010. In a statement, Guaido urged all foreign embassies in the country to disobey Maduro's orders and not remove their diplomats. 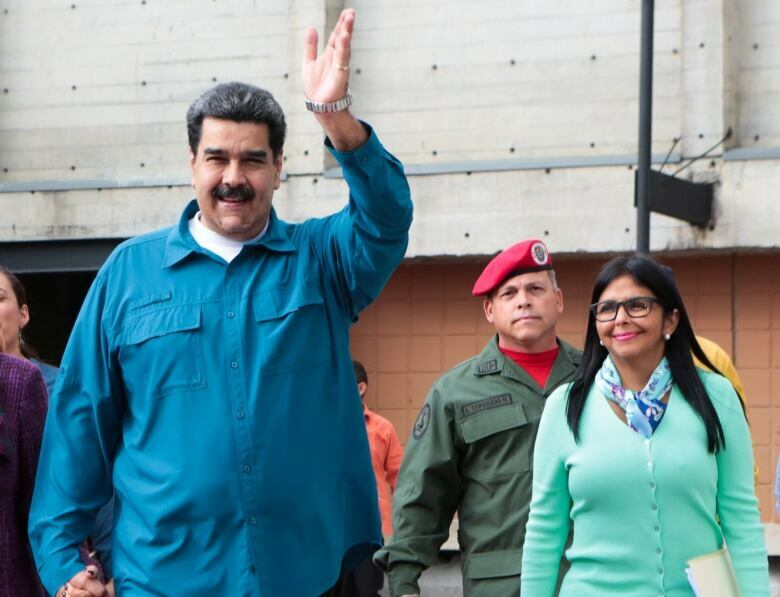 Maduro also called on the country's military to maintain unity and discipline, after the leader of the opposition-controlled congress declared himself interim president and asked for the armed forces' support. 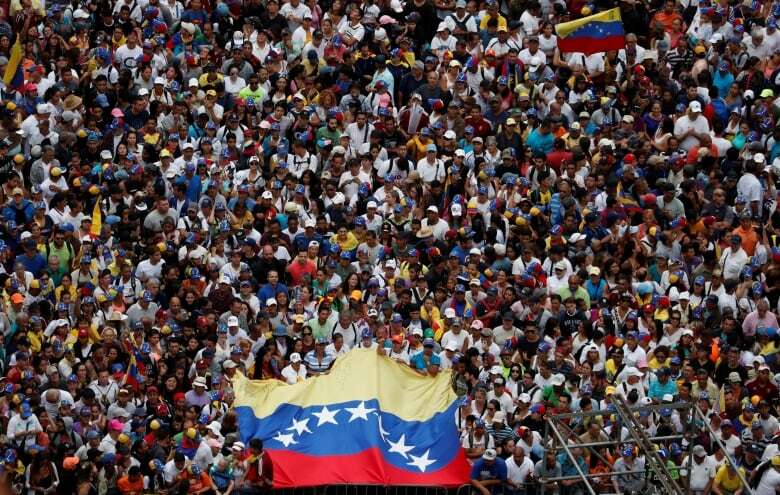 "We will triumph over this as well, we will come out victorious," Maduro told supporters outside the Miraflores presidential palace in Caracas. Asked if he would send the U.S. military into Venezuela, Trump said on Wednesday that all options are on the table. "We're not considering anything, but all options are on the table," he told reporters at the White House. 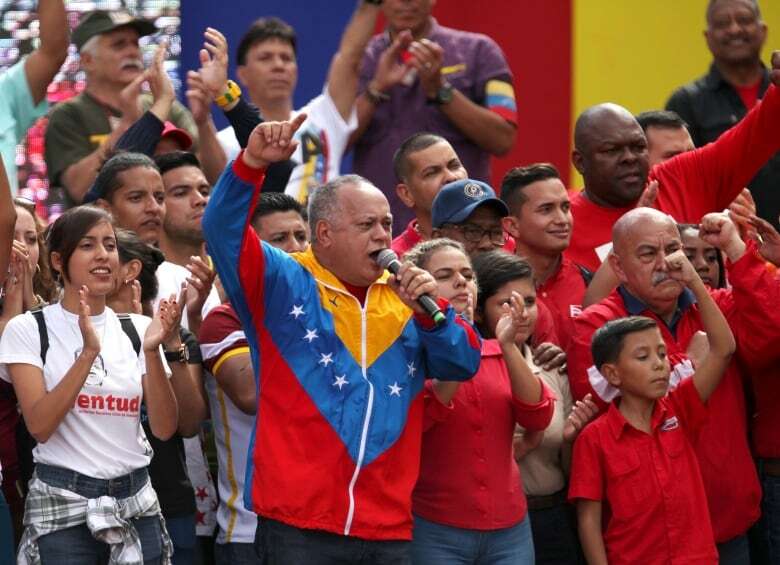 Socialist party boss Diosdado Cabello is calling on government supporters to mobilize in front of Venezuela's presidential palace to protect Maduro from what he is calling a U.S.-led conspiracy to remove him from power. U.S. Secretary of State Mike Pompeo earlier called on Maduro to step aside and urged the country's military to support efforts to restore democracy. "The Venezuelan people have suffered long enough under Nicolas Maduro's disastrous dictatorship," Pompeo said. "We call on Maduro to step aside in favor of a legitimate leader reflecting the will of the Venezuelan people." Any change in government in Venezuela will rest on a shift in allegiance within the armed forces, which has stood by Maduro through two waves of street protests and a steady dismantling of democratic institutions. "We need freedom, we need this corrupt government to get out, we need to all unite, so that there is peace in Venezuela," said Claudia Olaizola, a 54-year-old salesperson near the march's centre in the eastern Chacao district, a traditional opposition bastion. A 16-year-old was shot to death at a protest on Tuesday in western Caracas, according to a rights group, Venezuelan Observatory of Social Conflict. Three people were shot dead on Tuesday night in southern Bolivar City during a looting of a grocery store that followed a nearby protest, Bolivar state Gov. Justo Noguera said in a telephone interview. Maduro has presided over Venezuela's spiral into its worst-ever economic crisis. His re-election in 2018 was widely viewed as a sham due to widespread election irregularities. "We've come out to support the Opposition and preserve the future of my son and my family, because we're going hungry," said Jose Barrientos, 31, an auto-parts salesperson in the poor west end of Caracas.